Hello, my name is Jera and I am a former analyst for compLexity gaming. This is my third iteration of the tier list and reception has been kind. I’d like to state that the intention of these lists is to help players who want to emulate professionals by providing solid references, along with ways to research builds/runes/masteries further (just click on any of the champions). All of these champions are viable in solo queue, but truly shine in an environment that fosters teamwork and communication between all players. We plan on updating the site pretty soon, and the format of the tier list may be a bit long. Once I have a grasp on how I want to reformat the tier list, a new list should be made. Most professional teams tend to target ban opponents, rather than ban out the strongest champions in the meta. However, these champions are still incredibly strong and popular, thus are some of the most popular bans in competitive. Consider the champions on this list “S-Tier”. Remember when Kassadin was nerfed because he was perma-banned for almost an entire season of LCS? Well, he’s back in jail and is one of the most common first pick champions overall due to his overwhelming presence with 2 items. Mandatory red side ban. Although Braum has not been enabled to tournament play yet, many of the professional supports have been vocal of how strong this support is. Because Braum is a walking meat-shield / cc-bot, Braum may see bans just so teams don’t have to deal with him. Shyvana has become a popular ban in recent times due to the balance of mid-lane champions freeing up a ban. Shyvana is strong at everything and has very few exploitable weaknesses. Despite bans typically straying away from the bottom lane, Twitch may be the new exception. The kit of Twitch allows him to be a massive bully in lane, and a huge teamfight threat in the late game. With a 70% attack speed steroid at level 12. These champions are the strongest relative to each other in their respective roles. Most of these champions are seen in 75% of competitive play due to their strengths in teamplay or ability to take over a game. The shade of red indicates the relative power within the top-tier list. Right now the “core” top lane champions are Jax, Shyvana, and Trundle at this time. However, in lower-level competitive play, more “interesting” carry picks are like Yasuo, Kayle, and Kha’Zix have started to sprout due to teams not knowing how to execute a 2v1 lane properly. +1 Trundle has been one of the best top lane champions over the past few months, due to the versatility of his kit and his ultimate being a strong way to destroy a front-line tank. Trundle is typically one of the best options for dealing with Shyvana and Dr. Mundo, so Trundle becomes a high priority pick. –4 Renekton is a major lane bully that shuts down most of the top lane match-ups. The problem is that Renekton loses most of his advantage in 2v1 lanes, which are set up for farm/xp denial at this time. — Dr. Mundo has been hanging out near the top of the list for quite some time, and has been used as a “brute force” front-line tank. Dr. Mundo does well in 2v1 lanes, and becomes extremely potent in the late (4+ completed item) game. +5 Originally, I had placed Irelia lower due to her low win-rate in the off-season of LCS. Since then, I’ve moved her up a bit as a mid-tier due to her sustain, mixed damage and dueling. Irelia is VERY popular in EU. +8 Top lane Lulu is another “off-meta” pick that was popularized by Fnatic’s sOAZ and also played by Samsung Blue’s Acorn in OGN Spring 2014 championships, and most recently in NA LCS by TSM Dyrus and Curse Quas. Lulu top could best be described (by opponents) as “annoying” due to her harass and “safety” of her lane. — Kha’Zix top is an “off-meta” pick that has been popularized by EG’s Innox. Kha’zix typically farms up and tries to clean up fights, but can become useless if Kha’zix falls behind or if kills are not secured. NEW Rengar has started to creep into the ban list against certain top lane players. Rengar’s kit was changed several patches ago, and his burst damage lowered, but Rengar does a deceptive amount of damage with items. At this moment, there are a “Core 4” jungler pool of Lee Sin, Evelynn, Elise, and Kha’Zix, while the other junglers remain less desirable in standard compositions. Other junglers can be used for more specific compositions, such as with Vi/Jarvan with Yasuo or Nunu in a more supportive role. +1 Lee Sin is back on top as the #1 jungler at the time. With his strong early-game kit, along with more junglers spending significant time practicing him, Lee Sin is often picked up in the first round of draft. — In the recent patches, Kha’Zix took a big hit in the dive department, making it much more risky and harder to accomplish. Despite the nerfs, Kha’Zix is still a very strong jungler if he can snowball ahead. — Vi, while not being on the same level as the “Core 4”, is a strong engage champion that works well with Yasuo. Vi is usually vulnerable in the first few levels, but can quickly make it back up with her ultimate. +4 Nunu is an old-school utility based jungler that has become popular lately, where he is used to peel/buff allies and steal the enemy jungle. While Nunu won’t be putting out the most damage directly, Nunu increases the mobility and damage of a carry, while keeping the carry safe. +3 Jarvan IV received a few small changes in patch 4.7, but they helped his lane abilities more than his jungle. Jarvan is a hard engage champion that can trap people together for some serious wombo; however, Jarvan fulfills a engage role similar to Vi, but with worse mana costs and a higher risk/reward. -2 Wukong has fallen quite far from grace, due to his predictability when ganking and his early vulnerability in his own jungle. Wukong works well in “wombo combos” and with Yasuo, but there are better alternatives. -8 Pantheon took a huge hit in patch 4.7 which made his ultimate into stun combo impossible to pull off if the opponents are paying attention. Pantheon may receive some buffs soon due to the change emasculating our favorite Spartan. The midlane champion pool is actually quite open at this time. Most of the champions in the Top-Tier list, as well as most of those in the Competitive-Viable, should be seen in competitive play. The mid lane has the most champion diversity in comparison to other roles. +2 LeBlanc has always been one of the best counterpicks for mid, and can do well if picked blind. LeBlanc has to make use of her level 6 all-in, or receive an early gank from junglers. Once LeBlanc has that first kill, it is very hard to slow her down. +7 Yasuo has become one of the more popular mid lane champions around the world, and is one of the most entertaining mid lane champions to watch. The devastation that Yasuo brings to a composition is massive, but typically forces other laners to pick mixed damage champions. +6 Kayle has been one of the most popular EU mid lanes as of late, favoring the build rushing a Runaan’s Hurricane for the second item. This allows Kayle to clear waves quickly and do massive AoE damage within a teamfight. -3 We haven’t seen a ton of Ziggs around lately, mainly due to the fact that mid lanes have become more aggressive in playstyle and teamfights have started to revolve around flanking, rather than clumping and moving in straight lines. Ziggs is still a solid pick, but just isn’t as favored with the strong mids at this time. -1 Syndra is a burst mage with a ranged stun that does huge damage. Patch 4.7 brought some unannounced changes/bugs that altered her “billiard trajectory”, changing the calculation form 4.6 to 4.7, which can be troubling for most Syndra players. -7 Soraka took a huge hit from the nerf bat, lowering her damage output and taking away her free ranged harass with Infuse. While the fundamental idea of Soraka is unchanged, her ability to lane efficiently took a HUGE hit. — Fizz is one of the mids that has been lurking just below the surface of competitive play for months now, but just hasn’t found success like LeBlanc. Patch 4.7 fixed an issue with Fizz where he would still be hit by targeted spells, even when he should be untargetable. — Lissandra is one of the “off-meta” mids for teams that need to find some sort of engagement/CC from a lane. Using Lissandra for engagement is a risky proposition, and works best against AD mids (which have started to die off, aside from Yasuo!). It’s difficult to rate the ADC skill tree outside of Lucian/Twitch. Most of the ADCs are well-balanced and depend on player preference. Kog’Maw is the rising star at this moment. Strangely enough, more AD Carries are starting to build an Offensive 4th item (usually IE), instead of the traditional defensive Banshees or Randuins and expect proper positioning and peel to keep the ADC alive. +9 Kog’Maw has been starting to see some exposure in the Korean competitive, as well as experimentation in the Western scene. Kog’Maw works well as a tank shredder and for tower siege, and has adequate defense versus a single target with a Cutless/BotRK and his Void Ooze for slow. +2 Corki was one of the stronger ADC picks in North America/Korea due to his mixed damage and harass. The issue with Corki is that he has a very short Auto Attack range which makes his tower siege difficult. Corki has good poke and can pop Banshees Veils easily. -1 Graves has started to falter in competitive play, due in part to his low range in auto-attacks. Since dives are becoming more and more manageable by champions that synergize well Blade of the Ruined King, Graves has dropped in priority. -3 Jinxhas fallen further down the priority tree, mostly due to teams not investing as much into “reset champions” outside of Kha’Zix. Jinx works best with fast push compositions, but the changes to tower defenses and teams understanding wave manipulation better make Jinx much harder to justify. +2 Miss Fortune is the an ADC that is starting to seep into competitive play. With changes to Miss Fortune’s kit, her mixed damage output is quite high, and she performs admirably in lane. Once again, the issue (as with most legacy ADCs) is the lack of a reliable escape versus champions with gap closers. Along with her ultimate making her a sitting duck, Miss Fortune needs real protection to shine. -2 Sivir was a common pick early in season 4 when mobility compositions were all the rage. Since then, Sivir received a few nerfs, and run-forward comps became less common. However, the mobility composition does still exist and is strong, but players have been favoring more lane dominance rather than utility teamwork from an ADC. The core support champions consist of Morgana, Thresh, and Nami. I fully expect Braum to enter the “core rotation” once he is available in competitive play. — Morgana has been a common pick in North American and European competitive (but strangely not so much in Korea). Morgana has two major components to her kit: the first is Dark Binding which snares for up to 3 seconds and can serve as an engagement cue. The second is Morgana‘s Black Shield, which can negate most forms of enemy engagement or ensure that friendly engagement cannot be stopped. +4 Zyra has returned to the competitive scene, starting with a demonstration by SKT T1 K at All-Stars, and then adoption by most teams afterwards. Zyra brings great disengage and strong harass in lane, making her a solid support. — Nami has become a common pick in Korean competitive as an excellent lane trader as well as the versatility of engagement/disengage. Nami tends to force opponents to fan out in teamfights, or else they risk chained CC onto multiple members. Nami is one of the harder supports to master, and is higher risk/reward than most of the other common support picks. -2 Lulu support is beginning to fall out of competitive play, due to her mana costs and limited ability to poke. Most teams prefer to stick Lulu mid where she can get items, but occasionally she is used with Yasuo compositions to deceive opponents early in draft. — Gragas support was something that I initially thought would be more popular, but has only been played by Gambit’s Edward. The damage soak and displacement by Gragas make him seem strong on paper, but he is having a rough time against meta supports. -2 Alistar has been one of the better supports to pacify an engage lane, and also as a massive disruptor in teamfights. Alistar is a tricky champion to master, and most teams are more concerned with AoE zoning or creating picks. — Blitzcrank hasn’t seen much play in competitive League of Legends as of late, mostly due to his hook successor Thresh having more utility in his kit. Blitzcrank can change the game with a well-timed grab, but the same could be said with most champions who have pick potential. Ultimately, Blitzcrank‘s kit isn’t as novel as it once was and therefore gets passed by. -4 Poor support Soraka took another hit to her laning phase, and dimished the amount of harass that she can bring to a duo lane. Soraka will now become a heal/mana bot as a support, turning a lane into complete passivity. Patch 4.8 did very little to the landscape of the game overall, but quantified the “undocumented” nerf to Pantheon, along with the nerf to Soraka. While this isn’t as much of a balance change, the meta for ADCs has started to favor Blade of the Ruined King in most build orders at some point. The reason is that BotRK has become a staple item for AD Carries is because it allows the ADC to escape from a single diver, while being able to kite it out, along with the base stats from the item. 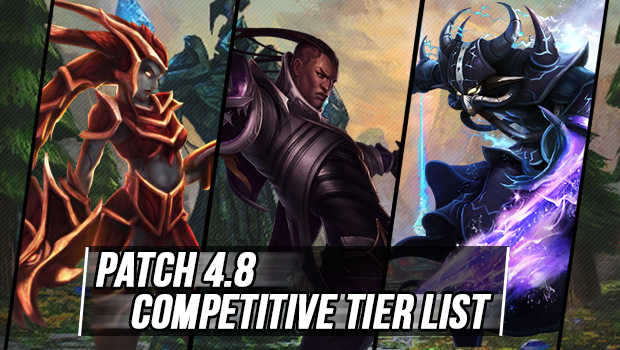 Thanks for checking out my 4.8 tier list! The LCS is being played on Patch 4.8 so there will likely be updates as the LCS games progress into the season. If you enjoyed content like this, feel free to share this on social media (there should be a bar to the left of the page if AdBlock is disabled), or bookmark the page for reference. If you have questions, feel free to send me a tweet @coL_Jera and I should reply somewhat quickly. 5/30/2014 – Kog’Maw up, Graves down, Nunu up, added header descriptions to all “Role Tier List” tabs.